City of Martensville Profile - Slade Real Estate Inc.
Martensville is a city located in Saskatchewan, Canada, just 8 kilometres (5.0 mi) north of Saskatoon, and 14 kilometres (8.7 mi) south west of Clarkboro Ferry which crosses the South Saskatchewan River. It is sometimes considered a bedroom community of Saskatoon. It is surrounded by the Rural Municipality of Corman Park No. 344. The community is served by the Saskatoon/Richter Field Aerodrome located immediately west of the city across Highway 12. 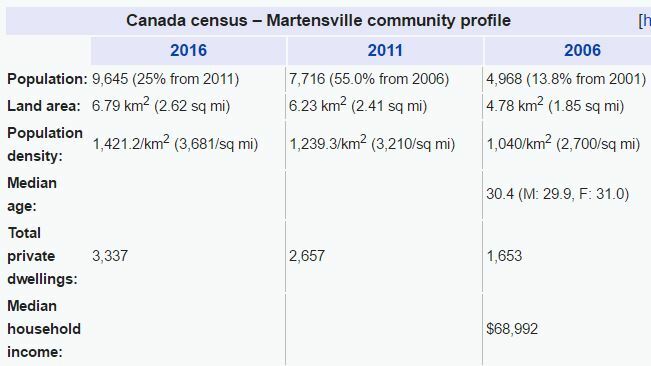 According to the 2016 Canadian census, the population of the Martensville is approximately 9,645, making the city the eleventh largest city in the province. 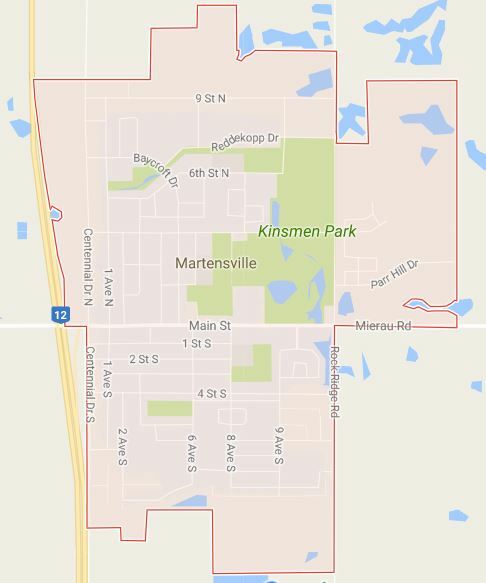 The Martensville was granted city status on November 3, 2009. History – In 1939, Isaac and Dave Martens purchased land north of Saskatoon. They then sold three small parcels of land to people who wanted to move out of Saskatoon and, as a result, the community of Martensville was created. Many Mennonites who worked in Saskatoon chose to live there to retain connections to the large Mennonite community of the Hague-Osler area. Martensville was later incorporated as a village in 1966 and as a town three years later in 1969. Sewer and water was established in 1976 with the town experiencing accelerated growth. In 2009, Martensville was incorporated as a city. Geography – Martensville, located between the North Saskatchewan River and South Saskatchewan River, is between 600 meters (2,000 ft) to 700 meters (2,300 ft) above sea level. Martensville is located just north of the moist mixed grasslands area typical of Saskatoon, and locates instead in an ecoregion of aspen parkland. It is located just 20 kilometers (12 mi) north of Saskatoon, and 14 kilometers (8.7 mi) southwest of Clarkboro Ferry, which crosses the South Saskatchewan River. The 10 km distance between Martensville and Warman is the closest between two chartered cities in the province. By comparison, Martensville is approximately 18 km north of downtown Saskatoon, its next closest neighbour. Martensville is in a dry-prairie/savanna biome and experiences warm summers and cold winters. Martensville has four distinct seasons. Average temperatures range from −17 °C in January to 18 °C in July. Martensville is fairly dry; with the summer being the wettest season. It belongs to the continental climate region of Canada which typifies warm summers according to the Köppen climate classification. The geology of the area are sandy plains which resulted from shorelines of glacial lakes and depositions from glacial lakes as the Laurentide ice sheet left the area. There are no large lakes in this area due to the sandy soils which drained away melting glacial waters. The lakes in this area are remnants of the South Saskatchewan river channels. Points of Interest – The city has seven lakes that are connected through a series of canals. The lakes and creeks are part of the Opimihaw Creek system. The lakes were created for water retention but are also used for a variety of year-round recreational activities including perch fishing, canoeing, and skating. The city has a new outdoor pool facility that opened in the summer of 2010. The facility includes a six-lane junior olympic-sized pool, a zero-depth entry pool, and a toddler pool. There are four waterslides and several spray features. It has a full-service concession and is right next to the community centre. Wanuskewin Heritage Park, a Provincial Heritage Property and interpretive centre, is located 5 miles (8.0 km) from Martensville, and the Sutherland Bird Sanctuary is within 10 miles (16 km). Arts and Culture – Martensville holds its annual Buster Days festival every June, usually in the first or second week. Buster Days is a 3-day festival that includes a parade, dances, softball, and, as of 2005, a volleyball tournament. Before 2005, a small exhibition took place that offered amusement rides, games, and food. Otherwise, its close proximity to Saskatoon – in particular the Credit Union Centre arena – allows residents easy access to that city’s events and attractions. Sports – Sports venues in Martensville include a kart racing track (Saskatoon Kart Racers), the North Ridge Centennial Centre, Chrome Dome Park (ball diamonds and soccer pitches and Geransky multipurpose field), Kinsmen Park (tennis, skate park, walking trails, ball diamonds, tobogan hill), North Hills Park, Sport Centre (rink where the Marauders play hockey and curling rink), aquatic facility and various neighbourhood parks. Adjacent to Kinsmen Park is the Martensville Athletic Pavillion. The Athletic Pavillion is a multipurpose indoor 50,000 square foot athletic facility. The Athletic Pavillion features various court spaces and multi-purpose rooms, a running track and fitness gym in addition to a reception area and concession. Martensville also hosts the Martensville Mustangs, who are a part of the Martensville Minor Baseball Association (MMBA), as well as the Martensville Maddogs football team and the high school team Martensville Royals. The city used to have a small golf course, but in May 2008 it was demolished to make way for new houses and a public swimming pool. Martensville’s bowling alley was also closed in 2008, and replaced by a gym in late 2009. In the summer of 2008, the former bowling alley was used as a filming location for the second season of the Canadian television show, Rabbit Falls. Education – Martensville received its first school in 1953. Martensville is served by two elementary schools and one high school in the Prairie Spirit School Division. Valley Manor Elementary School is located on the south side of Martensville, while Venture Heights Elementary School and the Martensville High School are both located on the north side. Each school has an enrollment of over seven hundred students. In the spring of 2008, $698,000 was allocated for portable classrooms at Valley Manor and Venture Heights Schools. A new public K-8 school will be opening for the 2017-2018 school year. Lake Vista Public School will be able to accommodate 450 students and is located in the new Lake Vista neighborhood. Historically pupils were served by the Halcyonia School District #1237 one-room school house at South West Section 28 township 40 Range 8 W of the 3 meridian, which was established by the historical Rural Municipality number 384. Some pupils may have attended Virtue one-room school house #2616, which was built at a later date at Tsp 38 Rge 6 W of the 3 meridian. In 2010, Catholic residents in Martensville formed a local Catholic school division which amalgamated with Greater Saskatoon Catholic Schools shortly thereafter. It was revealed on June 23, 2015, that the division’s new elementary school in Martensville will be named Holy Mary Catholic School and it is expected to be complete by 2017. #AskSlade about properties currently for sale in the city of Martensville. Slade Real Estate Inc. 306-222-9992.